1. Create a PDF version of your magazine – Most publishers already have a PDF file for the print version of their publication, so this can also be considered as the step zero. 2. 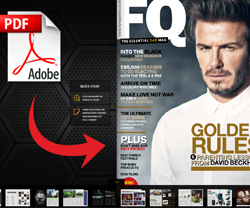 Import your PDF file – Import the PDF to the 3D Issue Flipbooks software. 3. Optimize your digital magazine for SEO – Readers will need to find your magazine, and the first place they’ll go to are the search engines. You can add your FTP and SEO details easily and directly into the software and make your digital magazine a part of your digital marketing efforts. 5. Preview – Check if everything is ok before you release the final version. 6. Build and publish – The last step. You now have the digital magazine version of your PDF. We’ve talked about the automation of the whole process and the steps above, although they make everything as easy as pie, aren’t really automating it. Knowing that many publishers already have the perfect PDF document that they just want to convert into a digital magazine, we worked on creating a one-click solution. After installing our software, you’ll notice the creation of a “hot folder”. If you drag and drop a PDF file in there, that PDF will automatically be transformed into a digital magazine. You can search for free solutions on the net, but you’ll hardly find a single one that offers full customization and a professional feel. With our software, not only do you get both an easy way to convert a PDF to a digital magazine and a platform where you can connect all of your other marketing channels, but you also have access to a dedicated support team that will help you achieve the perfect results. Imagine yourself having a digital magazine where you can add your YouTube videos, your company’s anthem, responsive banners from your advertisers, links to your site and those of your sponsors, and much more. If you are interested in knowing more about our digital publishing solutions you can email us at info@3dissue.com or you can download our free trial.